There is no doubt that the amount of dissolved oxygen in the water has a major impact on fish behaviour and survival. What actually is dissolved oxygen though, where does it come from and what happens if there is insufficient available? “Dissolved oxygen refers to the level of free, non-bonded oxygen present in water or other liquids. The red arrows indicate the free oxygen (O2) in the image below. It is an important parameter in assessing water quality because of its influence on the organisms living within a body of water. In limnology (the study of lakes), dissolved oxygen is an essential factor second only to water itself. A dissolved oxygen level that is too high or too low can harm aquatic life and affect water quality. Dissolved oxygen is the presence of these free O2 molecules within water. The bonded oxygen molecule in water (H2O) is in a compound and does not count toward dissolved oxygen levels. One can imagine that free oxygen molecules dissolve in water in much the same way that salt or sugar does when it is stirred. Dissolved oxygen is necessary to many forms of life including fish, invertebrates, bacteria and plants. These organisms use oxygen in respiration, similar to organisms on land. Fish and crustaceans obtain oxygen for respiration through their gills, while plant life and phytoplankton require dissolved oxygen for respiration when there is no light for photosynthesis. The amount of dissolved oxygen needed varies from creature to creature. 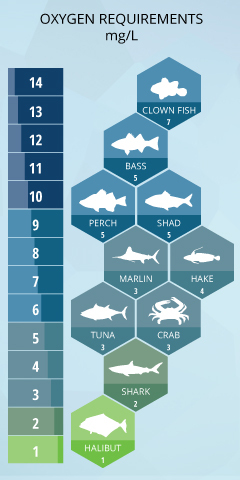 Bottom feeders, crabs, oysters and worms need minimal amounts of oxygen (1-6 milligrams per Litre of water or 1-6 mg/L), while shallow water fish need higher levels (4-15 mg/L). Microbes such as bacteria and fungi also require dissolved oxygen. These organisms use dissolved oxygen to decompose organic material at the bottom of a body of water. 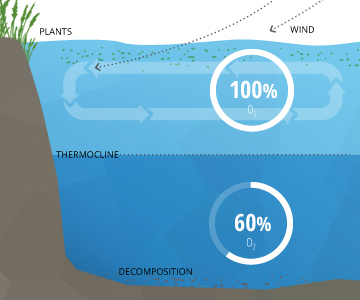 Microbial decomposition is an important contributor to nutrient recycling. However, if there is an excess of decaying organic material (from dying algae and other organisms), in a body of water with infrequent or no turnover (also known as stratification), the oxygen at lower water levels will get used up quicker. Dissolved oxygen enters water through the air or as a plant byproduct. From the air, oxygen can slowly diffuse across the water’s surface from the surrounding atmosphere, or be mixed in quickly through aeration, whether natural or man-made. The aeration of water can be caused by wind (creating waves), rapids, waterfalls, ground water discharge or other forms of running water. Dissolved oxygen is also produced as a waste product of photosynthesis from phytoplankton, algae, seaweed and other aquatic plants. While most photosynthesis takes place at the surface (by shallow water plants and algae), a large portion of the process takes place underwater (by seaweed, sub-surface algae and phytoplankton). Light can penetrate water, though the depth that it can reach varies due to dissolved solids and other light-scattering elements present in the water. Depth also affects the wavelengths available to plants, with red being absorbed quickly and blue light being visible past 100 metres below the surface. In clear water there is no longer enough light for photosynthesis to occur beyond 200 metres and aquatic plants no longer grow. In turbid water, this photic (light-penetrating) zone is often much shallower. 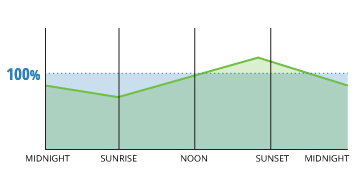 As aquatic photosynthesis is light-dependent, the dissolved oxygen produced will peak during daylight hours and decline at night. In a stable body of water with no stratification, dissolved oxygen will remain at 100% air saturation. 100% air saturation means that the water is holding as many dissolved gas molecules as it can in equilibrium. At equilibrium, the percentage of each gas in the water would be equivalent to the percentage of that gas in the atmosphere. The water will slowly absorb oxygen and other gasses from the atmosphere until it reaches equilibrium at complete saturation. This process is sped up by wind-driven waves and other sources of aeration. In deeper waters, dissolved oxygen can remain below 100% due to the respiration of aquatic organisms and microbial decomposition. These deeper levels of water often do not reach 100% air saturation equilibrium because they are not shallow enough to be affected by the waves and photosynthesis at the surface. This water is below an invisible boundary called the thermocline (the depth at which water temperature begins to decline). Two bodies of water that are both 100% air-saturated do not necessarily have the same concentration of dissolved oxygen. The actual amount of dissolved oxygen (in mg/L) will vary depending on temperature, pressure and salinity. First, the solubility of oxygen in water decreases as temperature increases. This means that warmer surface water requires less dissolved oxygen to reach 100% air saturation than does deeper, cooler water. For example, at sea level (1 atm or 760 mmHg) and 4°C (39°F), 100% air-saturated water would hold 10.92 mg/L of dissolved oxygen. However, if the temperature were raised to room temperature, 21°C (70°F), there would only be 8.68 mg/L of dissolved oxygen at 100% air saturation. Second dissolved oxygen decreases exponentially as salt levels increase. That is why, at the same pressure and temperature, saltwater holds about 20% less dissolved oxygen than freshwater. This is shown in the graph above. Third, dissolved oxygen will increase as pressure increases. This is true of both atmospheric and hydrostatic pressures. 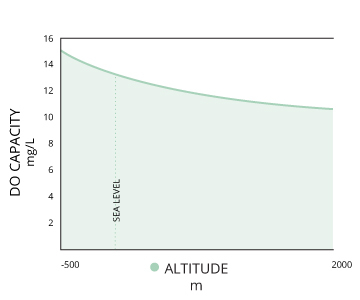 Water at lower altitudes can hold more dissolved oxygen than water at higher altitudes. This relationship also explains the potential for “supersaturation” of waters below the thermocline – at greater hydrostatic pressures, water can hold more dissolved oxygen without it escaping. Gas saturation decreases by 10% per metre increase in depth due to hydrostatic pressure. This means that if the concentration of dissolved oxygen is at 100% air saturation at the surface, it would only be at 70% air saturation three meters below the surface. In summary, colder, deeper fresh waters have the capability to hold higher concentrations of dissolved oxygen, but due to microbial decomposition, lack of atmospheric contact for diffusion and the absence of photosynthesis, actual dissolved oxygen levels are often far below 100% saturation. Warm, shallow saltwater reaches 100% air saturation at a lower concentration, but can often achieve levels over 100% due to photosynthesis and aeration. Shallow waters also remain closer to 100% saturation due to atmospheric contact and constant diffusion. If there is a significant occurrence of photosynthesis or a rapid temperature change, the water can achieve dissolved oxygen levels over 100% air saturation. At these levels, the dissolved oxygen will dissipate into the surrounding water and air until it levels out at 100%. 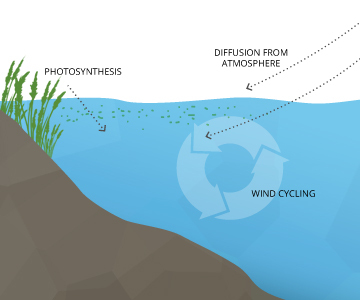 Aquatic respiration and decomposition lower dissolved oxygen concentrations, while rapid aeration and photosynthesis can contribute to supersaturation. During the process of photosynthesis, oxygen is produced as a waste product. This adds to the dissolved oxygen concentration in the water, potentially bringing it above 100% saturation. In addition, the equalization of water is a slow process (except in highly agitated or aerated situations). This means that dissolved oxygen levels can easily be more than 100% air saturation during the day in photosynthetically active bodies of water. Supersaturation caused by rapid aeration is often seen beside hydro-power dams and large waterfalls. Unlike small rapids and waves, the water flowing over a dam or waterfall traps and carries air with it, which is then plunged into the water. At greater depths and thus greater hydrostatic pressures, this entrained air is forced into solution, potentially raising saturation levels over 100%. Rapid temperature changes can also create dissolved oxygen readings greater than 100%. As water temperature rises, oxygen solubility decreases. On a cool summer night, a lake’s temperature might be 15° Celcius. At 100% air saturation, this lake’s dissolved oxygen levels would be at 9.66 mg/L. When the sun rises and warms up the lake to 21° Celcius, 100% air saturation should equate to 8.68 mg/L of dissolved oxygen. But if there is no wind to move the equilibration along, the lake will still contain that initial 9.66 mg/L dissolved oxygen, an air saturation of 111%. Dissolved oxygen concentrations are constantly affected by diffusion and aeration, photosynthesis, respiration and decomposition. While water equilibrates toward 100% air saturation, dissolved oxygen levels will also fluctuate with temperature, salinity and pressure changes. As such, dissolved oxygen levels can range from less than 1 mg/L to more than 20 mg/L depending on how all of these factors interact. In freshwater systems such as lakes, rivers and streams, dissolved oxygen concentrations will vary by season, location and water depth. 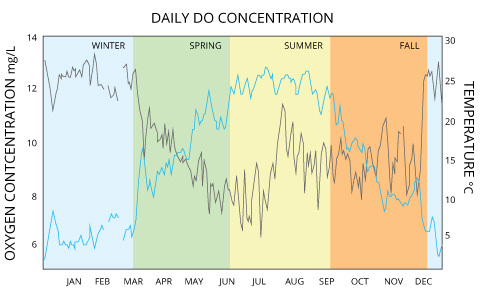 The graph above, where dissolved oxygen is the black line, shows how dissolved oxygen levels vary with the seasons. Rivers and streams tend to stay near or slightly above 100% air saturation due to relatively large surface areas, aeration from rapids, and groundwater discharge, which means that their dissolved oxygen concentrations will depend on the water temperature ¹. While groundwater usually has low dissolved oxygen levels, groundwater-fed streams can hold more oxygen due to the influx of colder water and the mixing it causes. Saltwater holds less oxygen than freshwater, so oceanic dissolved oxygen concentrations tend to be lower than those of freshwater. In the ocean, surface water mean annual dissolved oxygen concentrations range from 9 mg/L near the poles down to 4 mg/L near the equator with lower levels at further depths. 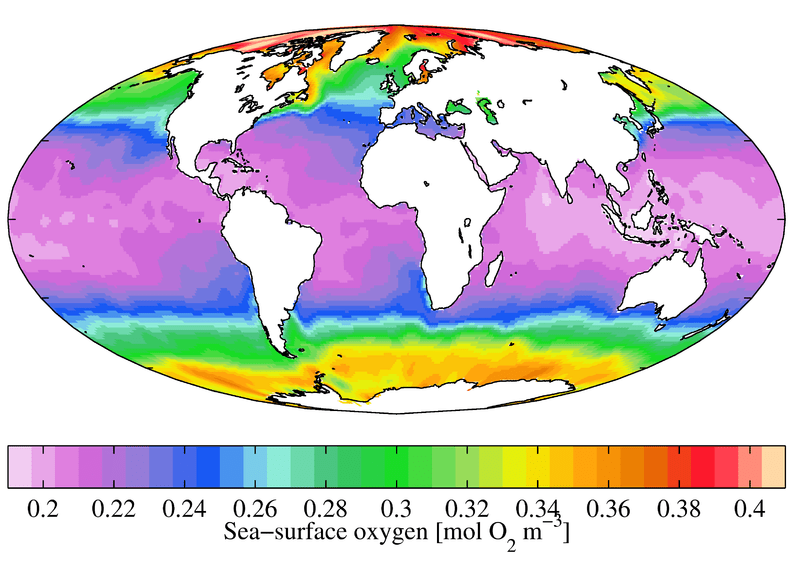 There are lower dissolved oxygen concentrations near the equator because salinity is higher. Coldwater fish like trout and salmon are most affected by low dissolved oxygen levels . The mean dissolved oxygen level for adult salmonids is 6.5 mg/L, and the minimum is 4 mg/L. These fish generally attempt to avoid areas where dissolved oxygen is less than 5 mg/L and will begin to die if exposed to levels less than 3 mg/L for more than a couple days. For salmon and trout eggs, dissolved oxygen levels below 11 mg/L will delay their hatching, and below 8 mg/L will impair their growth and lower their survival rates. When dissolved oxygen falls below 6 mg/L (considered normal for most other fish), the vast majority of trout and salmon eggs will die. Bluegill, Largemouth Bass, White Perch, and Yellow Perch are considered warmwater fish and depend on dissolved oxygen levels above 5 mg/L. They will avoid areas where dissolved oxygen levels levels are below 3 mg/L, but generally do not begin to suffer fatalities due to oxygen depletion until levels fall below 2 mg/L. The mean dissolved oxygen levels should remain near 5.5 mg/L for optimum growth and survival. 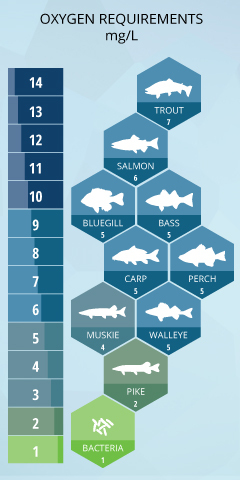 Walleye also prefer levels over 5 mg/L, though they can survive at 2 mg/L levels for a short time. Muskie need levels over 3 mg/L for both adults and eggs. Carp are hardier, and while they can enjoy dissolved oxygen levels above 5 mg/L, they easily tolerate levels below 2 mg/L and can survive at levels below 1 mg/L. The freshwater fish most tolerant to dissolved oxygen levels include fathead minnows and northern pike. Northern pike can survive at dissolved oxygen concentrations as low as 0.1 mg/L for several days, and at 1.5 mg/L for an infinite amount of time. Fathead minnows can survive at 1 mg/L for an extended period with only minimal effects on reproduction and growth. 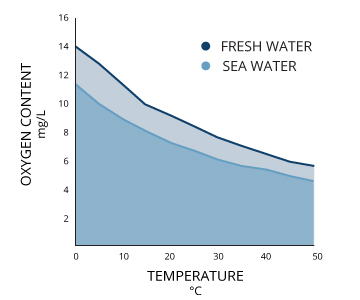 Saltwater fish and organisms have a higher tolerance for low dissolved oxygen concentrations as saltwater has a lower 100% air saturation than freshwater. In general, dissolved oxygen levels are about 20% less in seawater than in freshwater. This does not mean that saltwater fish can live without dissolved oxygen completely. Striped bass, white perch and American shad need dissolved oxygen levels over 5 mg/L to grow and thrive. The red hake is also extremely sensitive to dissolved oxygen levels, abandoning its preferred habitat near the seafloor if concentrations fall below 4.2 mg/L. The dissolved oxygen requirements of open-ocean and deep-ocean fish are a bit harder to track, but there have been some studies in the area. Billfish swim in areas with a minimum of 3.5 mg/L dissolved oxygen, while marlins and sailfish will dive to depths with concentrations of 1.5 mg/L. Likewise, white sharks are also limited in dive depths due to dissolved oxygen levels (above 1.5 mg/L), though many other sharks have been found in areas of low dissolved oxygen. Tracked swordfish show a preference for shallow water during the day, basking in oxygenated water (7.7 mg/L) after diving to depths with concentrations around 2.5 mg/L. Albacore tuna live in mid-ocean levels, and require a minimum of 2.5 mg/L, while halibut can maintain a minimum tolerance threshold of 1 mg/L. Many tropical saltwater fish, especially those surrounding coral reefs, require higher levels of dissolved oxygen. Coral reefs are found in the euphotic zone (where light penetrates the water – usually not deeper than 70 m). Higher dissolved oxygen concentrations are generally found around coral reefs due to photosynthesis and aeration from eddies and breaking waves. These dissolved oxygen levels can fluctuate from 4-15 mg/L, though they usually remain around 5-8 mg/L, cycling between day photosynthesis production and night plant respiration. In terms of air saturation, this means that dissolved oxygen near coral reefs can easily range from 40-200%. Crustaceans such as crabs and lobsters are benthic (bottom-dwelling) organisms, but still require minimum levels of dissolved oxygen. Depending on the species, minimum dissolved oxygen requirements can range from 4 mg/L to 1 mg/L. Despite being bottom dwellers, mussels, oysters and clams also require a minimum of 1-2 mg/L of dissolved oxygen, which is why they are found in shallower, coastal waters that receive oxygen from the atmosphere and photosynthetic sources. The uppermost layer of a lake, known as the epilimnion, is exposed to solar radiation and contact with the atmosphere, keeping it warmer. The depth of the epilimnion is dependent on the temperature exchange, usually determined by water clarity and depth of mixing initiated by wind. Within this upper layer, algae and phytoplankton engage in photosynthesis. Between the contact with the air, potential for aeration and the byproducts of photosynthesis, dissolved oxygen in the epilimnion remains near 100% saturation. 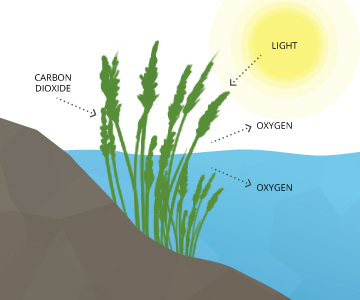 The exact levels of dissolved oxygen vary depending on the temperature of the water, the amount of photosynthesis occurring and the quantity of dissolved oxygen used for respiration by aquatic life. Below the epilimnion is the metalimnion, a transitional layer that fluctuates in thickness and temperature. The boundary between the epilimnion and metalimnion is called the thermocline – the point at which water temperature begins to steadily drop off . 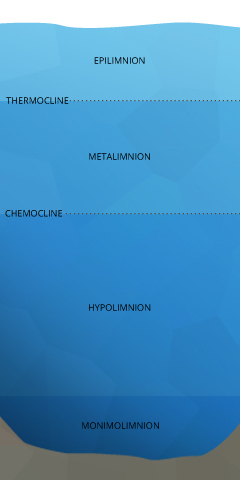 Below the metalimnion is the hypolimnion. This deep, cold layer has a more gentle temperature drop toward the bottom. Generally most fish will hold at or about 1 -2 metres above the thermocline. Estuary stratifications are based on salinity distributions. Because saltwater holds less dissolved oxygen than freshwater, this can affect aquatic organism distribution. The stronger the river flow, the higher the oxygen concentrations. This stratification can be horizontal, with dissolved oxygen levels dropping from inland to open ocean, or vertical, with the fresh, oxygenated river water floating over the low dissolved oxygen seawater. When the stratification is clearly defined, a pycnocline divides the fresher water from the salt water, contributing to separate dissolved oxygen concentrations in each strata. 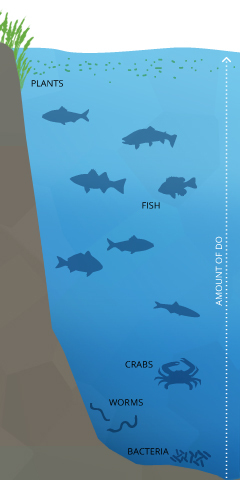 If dissolved oxygen concentrations drop below a certain level, fish mortality rates will rise. Sensitive freshwater fish like salmon can’t even reproduce at levels below 6 mg/L. In the ocean, coastal fish begin to avoid areas where dissolved oxygen is below 3.7 mg/L, with specific species abandoning an area completely when levels fall below 3.5 mg/L. Below 2.0 mg/L, invertebrates also leave and below 1 mg/L even benthic organisms show reduced growth and survival rates”. In summer, when the water temperature increases, river fish will hold in deeper, shaded areas where the water is colder, areas where cooler side streams enter the main river, in pockets of cooler water or in riffly water as this is where the dissolved oxygen levels are higher. Their feeding behaviour may also change to take advantage of the higher dissolved oxygen levels and cooler temperatures around dawn and dusk. In lakes and reservoirs many prey species and predators will aggregate around the thermocline particularly during the daytime. This zone represents the coolest water in the lake that contains adequate dissolved oxygen for use by fish. It also harbors more zooplankton (micro-crustaceans) during daylight hours and thus provides high food abundance for prey fish. Many modern fish finders can detect the thermocline as the density change in the water is strong enough to deflect sonar. Learning to find the thermocline is a critical skill for lake and reservoir anglers. Also in lakes fish will hold at the mouths of rivers and streams entering the lake as this is where the water is often cooler and contains higher levels of dissolved oxygen. Some anglers carry a thermometer to measure water temperature as this provides clues as to where the dissolved oxygen levels are higher and thus where fish may be holding. 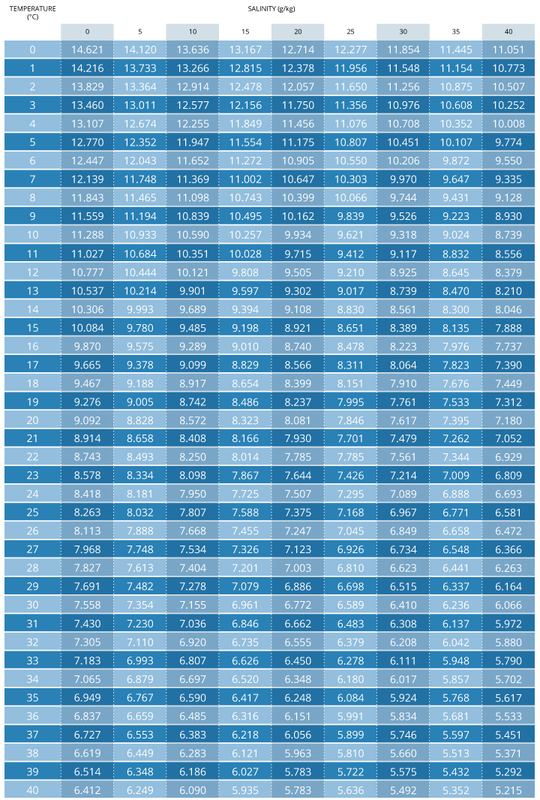 The chart below shows how the dissolved oxygen levels change with salinity and temperature. Typically seawater has a salinity of 35 grams of salt per kilogram (3.5%) whereas freshwater has 0 grams per kilogram. When fresh and saltwater streams meet the freshwater will rise above the saltwater as it is less dense and forms a layer. Fish in estuaries will hold downstream of a freshwater inflow especially when the tide is running strongly and mixing the two layers. This is because the dissolved oxygen level of the mixed streams is higher due to the lower salinity. As you can see Dissolved oxygen is one of the many factors which helps anglers identify where fish are likely to be holding and this is why it is very important to have a basic understanding of it. Thanks for the post allot of information in their. To simplify whats detailed above if you are fishing for say bass in the Epilimnion column in higher then usual water temperatures the dissolved oxygen available would be less then the Metalimnion column which could lead to the fish avoiding the higher column? Correct. Fish will hold about 1-2 metres above the thermocline in the Epilmnion. If the water temperature gets too warm in the Epilmnion then they will drop deeper to the very top of the Metalimnion. Thanks for the reply. The bass i fish for in Australia have a reputation for “going off the bite” when the barometric pressure drops to levels below 1018. I have been told this is due to their swim bladder expanding and possibly shrinking their stomach however i noticed that you touched on atmospheric pressure will also has an effect on dissolved oxygen. This may also play a part in the behaviour. Very interesting read thanks again. Thanks for the insightful feedback. As any diver is taught during training, pressure above the surface of the water does not have any effect on the pressure felt as you descend underwater. Similarly barometric pressure cannot affect the size of a swim bladder as water is not compressible. Barometric pressure affecting dissolved oxygen content is a much more plausible explanation for fish “going off the bite”. I’m currently reading a book on how barometric pressure affects fish behaviour and to be honest it is largely based on anecdotal evidence rather than established scientific principles. Thanks Tony. Will check it out. Bass, Walleye, moreover all fish notice small changes in their environment. Commonly referred to as Cold Blooded Animals – a misleading term – properly referred to as “Ectotherms”. These are animals that do not have an internal mechanism for regulating body temperature fish, snakes, lizards, reptiles, their body temperatures, metabolism, and chemistry matches the surroundings they live in; relying on solar energy captured by the environment (all practical energy, however manifested, comes from the Sun and the Moon). Unlike warm blooded creatures, fish have no comparable way to counterbalance the stress of having to maintain an imbalance. Depending on their chosen niche or starting point, fish become, or lean toward being active when warmer than normal and inactive – moving slower – when colder. In addition, fish must maintain some consciousness of neutral buoyancy in order to function at their best. Internal gas bladders are the ticket for maintaining neutral buoyancy. Too much fish movement up or down in the water column, or for too long a period produces an imbalance of water pressure on the outside and the amount of gas within the gas bladder of fish that have them. Making an adjustment to maintain neutral buoyancy causes stress. Additionally, when a fish moves it produces energy. Muscle movement produces heat energy which to some minor extent offsets normal body temps influenced by external water temperatures. When environmental changes occur, fish must adjust. Too much, or constant adjustment throws their systems out of whack, stunts growth, and they cannot maintain any sense of favorable normalcy one niche to another. If that environment they live in changes drastically and rapidly enough in one or more ways, they shut down in part or in whole while making an adjustment to those changes. How fast they adapt or how much they need to do so depend on factors we will get into later. A thermocline usually sets up horizontally in the middle layer and is part of a stratum of water with greater practical stability than any other part of the lake. These things and their interplay will tell us a lot about what is going on there. Cold water sinks because it’s more dense and heavier than warm water. Deeper water is under a great deal more pressure – PSI (pounds per square Inch) – than the warmer water above it. Anything under pressure wants to escape that pressure if it can. When the shallow water temperature decreases to a point where it no longer has an offsetting factor –holding power – to the water volume part of the equation, the shallower but larger volume of water gains weight so to speak, and pushes downward (gravity), mixing rapidly with whatever is beneath it. At that point, all layers would then be of equal temperature, density, and viscosity – the fall turnover once again. The steeper, narrower, and less wind directed the part of the lakes basin, the shallower, the thermocline will set up, and sooner and the faster the Fall Turnover will occur there. The exception to this entry is stained water. While the thermocline will set up shallower in stained water, the heat retention quality of such water will make the time till turnover longer. In some cases, thermoclines do not set up at all. These cases are depth and current related, along with the interplay of the other factors mentioned above to one degree or another. Warm water holds less dissolved oxygen than cold water. However, the deeper we figuratively look into the water column the more Dissolved Oxygen dissipates. Aside from dead and rotting veggie and animal material consuming any oxygen found deep, wind and wave causing oxygen can’t mix deep, colder water is more dense and viscous; acting as a barrier, and deep-water pressure squeezes oxygen molecules toward the path of least resistance. All of these actions develop an oxycline just as real and attractive as the ways and means of approaching the thermocline. Other clines such as pH, light penetration, algae-clines, etc., react similarly relative to hydrodynamics, and thermodynamics and they can move. Water entering the lake through creeks or underwater springs represents stabilization. This water is not affected by the turnover. In many ways, this water is a flowing river or stream, it is often somewhat warmer, and has greater oxygen content for some distance into the lake. Underwater springs don’t have too much – on the spot – oxygen in and of themselves. But, if shallow enough (under 30 feet) and if the flow is strong enough to mix the adjoining water, pulling surface water down around the edges, oxygen mix is created in the process. These areas have a – more or less constant stabilization all of their own. Then too we must include algae and weed growth in the big picture. Algae, is also aquatic vegetation; a thought process. Did you know that most oxygen in our world comes from a form of algae? Chlorophyll is a measure of photosynthesis. Oxygen is a byproduct of photosynthesis. Outside of waters nutrient composition, algae are the lowest form of live energy produced. Algae are also bacteria. Algae are present in all bodies of water. Not all specie of algae is present in all bodies of water. Live algae produce oxygen. When algae die, or when there is no light, oxygen depletion occurs. Some algae are greener than others. The greener the algae the greater its chlorophyll content: the more oxygen it produces; the better they are as food for primary consumers. The infamous “Red Tide” algae are an absolute killer. Primary algae consumers are largely zooplankton. Some algae float. Some algae suspend. Some algae are carried here and there, up and down by turbulence, the wind, and intensity of sunlight. Algae are affected by sunlight, water temperature, density, stratification, and molecular make up of water. Some algae can control their position in the water column. Some algae can move rapidly to position themselves where light and nutrients are optimal for growth. Some algae can photosynthesize under very low light conditions, either very deep in the water column or during those times of the day or year when sunlight isn’t very strong. Blue Green Algae compared to Green Algae tastes bad to primary consumers. Some algae blooms are beneficial; some are thick, a nuisance, and even deadly. Again, zooplankton eat algae. abundance. Localized Zooplankton abundance and position in the water column closely correlates to that of algae livelihood. Shad and minnow life of all kinds eat zooplankton. Larger fish eat smaller fish. When bacteria die in an Oxygen deficient zone, their cells will release phosphorus into the water column. There is an oxygen uptake but not a phosphorus uptake. This is what causes a drop in the oxygen levels from decaying plant and animal life. The phosphorus will not again become useful until it migrates into an area that has enough sunlight to allow photosynthesis to again occur. The oxygen level at this depth has no bearing on whether it will begin to occur. It is wholly dependent on light penetration, water temperature, and the presence of the algae in the water. Currents from flowing water or wind driven currents will decide how much mixing occurs to bring this phosphorus back up from the depths to become available again. When the water rolls over due to the temperature changes, the rising water will bring with it a huge flow of nutrients. The sinking water also brings oxygen down to the depths of many lakes and allows the fish to live much deeper than they were capable to have lived throughout the warmer water months. What we’re really looking at is current patterns, not necessarily algae growth patterns. The currents are what push the web of life. Follow the currents, however they are caused. The food ends up there. ALL FOOD and whatever is eating it. Algae will become “dormant” (for lack of a better word) when the conditions for growth and reproduction are not met or exceeded and float with the currents in the water and will be found throughout the water column. They do not come out of the bottom of the lake because they do not need a root system to generate from. They include all of the naturally occurring types of water borne flora and certain types will predominate at different temperatures and conditions. Once those conditions are met: temperature, nutrients and sunlight, the algae will kick in and experience a “bloom”. This is represented by an excessive growth phase where the algae consume too much of the available nutrients and in so doing removes too much for them to continue to grow and thrive. As this becomes a drag on the system a certain amount of them will die or go dormant. Whenever this happens, one of the first things a cell does is to dump its extra phosphorus back into the water. This will cause a secondary but lesser bloom. The dying and decaying masses will tend to clump together and cause an uptake (removal) of oxygen from the water. This is what causes the fish to become stressed and leave these areas or end up dying also. So, while the algae initially replenish the oxygen in the water through photosynthesis, they also will become a drag on the system too when they die and decay. When the fall turnover happens because of cooling water, the algae, and nutrients from the deeper portions of the lake are pulled up from the depths and exposed to sunlight again. If the water is not too cold at the surface the algae will again start the cycle all over again. For every 1 degree of temperature change up or down, there is a corresponding 10x increase or decrease in Biological activity. Temperature has a truly dramatic effect in this cycle. small fish and baitfish don’t need as much oxygen as larger fish. Larger fish may shoot in and out of those smaller fish locations to grab a meal. each situation on its own merit. Thanks Richard for taking the time to pen the detailed explanation above. Fascinating.